The World Organization for Animal Health (OIE), our global first line of defence against farm animal epidemics, just stacked the odds against stopping ISA virus from spreading in British Columbia. They stripped the lab I am using to track ISA virus of its international certification. Farm animal epidemics are considered one of the greatest threats to human food security and health. The OIE expects member countries to report diseases of global significance. One of these "reportable" diseases is the influenza family Infectious Salmon Anemia virus, ISAv. The OIE designates "reference" labs for each reportable disease. Being a reference lab is a perilous responsibility, because calling a new region "positive" for a reportable virus will cause economic hardship to large, powerful agri-businesses. They don't like that. We, the public, depend on these labs to stand up to this pressure and not take the easier course of action. I became concerned ISA virus could be spreading into the North Pacific from the Atlantic salmon feedlots when I read the BC government's many reports of the "classic lesions associated with ISA virus infection" in the Atlantic salmon being reared in BC. A small team of us have now sampled farm salmon from supermarkets across Canada and wild salmon throughout BC and I sent them to the closest ISA virus reference lab, Dr. Kibenge's lab at the Atlantic Veterinary College. This was the lab that diagnosed ISA virus in Chile, just before the virus went epidemic causing $2 billion in damages. No one in Chile recognized they had ISA until Kibenge diagnosed it, but by then it was too late. The virus had come from Norway in farm salmon eggs and raged through the country killing salmon. British Columbia is currently rated as an ISA-free region by the OIE and this brings considerable value to the BC farm salmon product. The USA has stated they do not want ISA virus contaminated salmon, so being ISA-free is critical to accessing the enormous US market, to the survival of the Norwegian salmon feedlot industry using BC to grow its fish. The CFIA testified at the federal Cohen Commission into the collapse of the Fraser sockeye salmon that if ISA virus is "confirmed" BC farm salmon trade will grind to a halt (see film above). These are big agribusinesses with Norway heavily invested. The Kibenge lab found pieces of RNA sequence, in my samples. When virologists detect sequences of RNA, they run them through databases that look for matches, like police run fingerprints. These RNA sequences matched European ISA virus, known to infect Atlantic salmon. Canada refuses to accept these matches as "confirmation" of the ISA virus, because they are only pieces of the virus. Canada does not even see these results as "suspect" for ISA virus. Canada requires the entire viral sequence or "virus isolation," before reporting to the OIE. However, no one has found the whole ISA virus in salmon which are simply carriers of the virus. The fish has to be dying of the virus for "virus isolation" to be successful. To get a fresh dying Atlantic salmon, you have to have access to salmon in the farm. This rule sets the bar so high, it prevents any kind of an early warning. It means the virus can be seeping out of the feedlots into the wild and no response is required. No lab studying ISA virus has ever faced the kind of samples I sent to the Kibenge lab, because nobody has ever gone looking for ISA BEFORE it goes epidemic. Most ISA virus researchers have access to dying farm salmon, we only have access to farm salmon in supermarkets. I have been highly criticized for testing the farm salmon in markets - but this is the only way I could ground-truth the BC vet's reporting that farm salmon in BC only look like they ISA virus, but not to worry that the virus is not actually present. Seven labs other labs testified at the Cohen Commission that they too found ISA virus sequence, but they have all gone silent since they were questioned under oath. Kibenge's lab is the only independent lab in Canada running samples provided by an independent biologist. November 2012 The CFIA recommended to the OIE that the Kibenge lab lose its "reference lab" status. On June 2013, the OIE removed their reference lab status from the Kibenge lab. A few days later the CFIA announced they could not find ISA virus in 4,175 wild salmon in BC using "virus isolation." This test has never worked on wild salmon, everyone involved knows this and the CFIA refuses to test the Atlantic farm salmon, for this Atlantic virus. I wrote to the Director General of the OIE to ask why they abandoned the Kibenge lab, but he won't say. To remove the "reference lab" status 178 OIE delegates had to vote - international consensus - decided the one lab free to work on ISA virus in BC should lose its credibility. Note all the delegates appear to be government bureaucrats. Each time the Kibenge Lab gets an ISA virus positive result, the CFIA takes the sample away from the lab with the understanding that they were retesting it. There have been many headlines to this affect. So apparently the OIE thought the CFIA was investigating the BC ISA virus positive results by retesting them using approved methods. The CFIA said they were going to "send the samples for testing..."
November 5, 2012, the CFIA talks about "disparate and non-repeatable results" from the Kibenge lab and recommends stripping the lab of its status. March 11, 2013 I ask the CFIA about their follow-up testing and the CFIA responded they are not doing any follow-up testing on my samples at all! time." 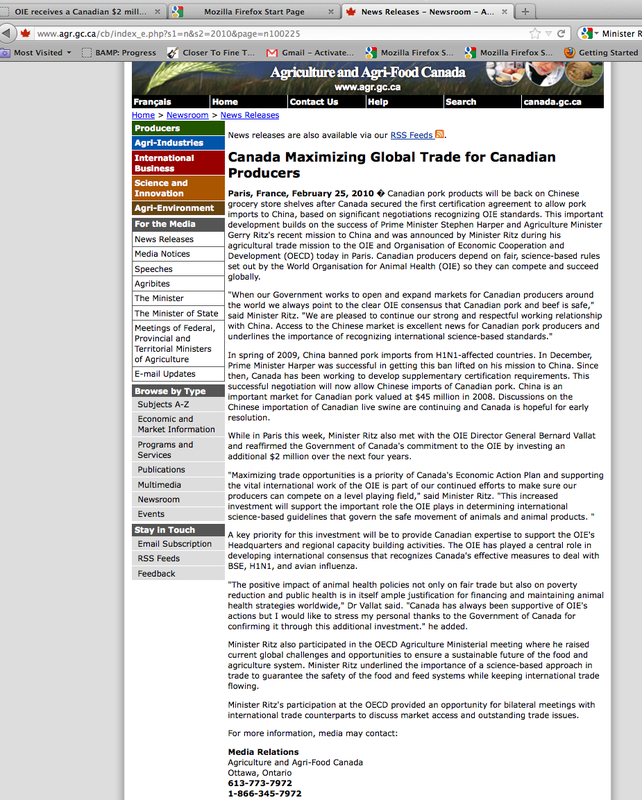 (email, Gary Kruger, CFIA, March 22, 2013). Shortly after writing this, Gary Kruger's CFIA email started bouncing. A few days after the OIE removed its authority and protection from the Kibenge lab the CFIA announced they sampled 4,175 wild salmon and could not find ISA virus. They used "virus isolation," on wild salmon, a test that has never been demonstrated to work, and did not test any of the millions of Atlantic salmon in net pens in BC waters for this Atlantic virus. This means, the virus could be the farms and entering wild salmon and it will never be detected by the CFIA, even though fragments of the virus have been found in wild salmon by seven labs, most of them working for the Canadian Fisheries and Oceans. "One battle is won, now we have to nail the surveillance piece, and we will win the war, also" (email Nov. 9. 2011, Joseph Beres CFIA). Well, the CFIA, did indeed "nail the surveillance piece." They are using a test that has never worked on wild salmon. They are winning this "war", by using a test that has never worked on wild salmon, they won't retest the positive results by a leading lab and they won't test the Atlantic salmon for this Atlantic virus. When I ask too many questions, emails start returning undelivered. In response, to the OIE decertification of Dr. Kibenge's lab several First Nations have written to the CFIA and the OIE stating they have samples of fish they have rights and title to in Dr. Kibenge's lab and they expect the ISA virus testing to be carried out uninterrupted. Many First Nation fishermen worked with me to allow me to sample their catches these samples of Fraser River salmon are in Dr. Kibenge's lab. I am going to make a prediction here, based on current trends. The work I am doing with Dr. Kibenge is going to be shut down and only the CFIA will be allowed to report on ISA virus in BC. ISA virus will be successfully denied for some period of time and then there will be outbreaks, like Newfoundland and Nova Scotia are facing right now and we the public will pay to clean it up, we will have to reimburse the farmers if they are ordered to cull their diseased fish, we will eat these diseased fish as they will be sold in the markets and we will live the great experiment on impact of a ferocious Atlantic salmon virus on Pacific wild salmon. The companies will be covered and the price of farm salmon will go up in Chile, if all their BC farm salmon die. It's a win win for them, loose, loose for the rest of us. Before my work with the Kibenge lab, look at how Fisheries and Ocean Canada handled ISA virus positive test results in 100% of the most endangered Fraser River sockeye stock, the Cultus Lake sockeye. They hid them from the Cohen Commission, with absolutely no consequence to that lab. The Simon Jones/Garth Traxler lab have their names on a draft report on ISA virus detection in BC's most endangered wild sockeye, a stock of salmon that caused entire fisheries closures at enormous losses to British Columbians, and they never went back to retest the fish, nor provided the document to the Cohen Commission despite specific orders to provide exactly this kind of information. One has to ask if this was done to protect the salmon feedlot industry from trade disruption. DFO suppresses ISA virus positive test results in BC salmon from Twyla Roscovich on Vimeo. ISA virus has gone epidemic everywhere in the world Atlantic salmon are raised in floating net pens. Every region has gotten one chance at an early warning and ignores it. They get hit with the epidemic, they regret it and spend enormous resources trying to get rid of it... but they ever do. Meanwhile the salmon feedlot industry carries on because when one region goes down with the virus, profits go up in the other parts of the world where they operate. All good here. Given the actions of the DFO, OIE and CFIA - BC has very little chance of heading off an epidemic.... it's a stacked deck, not in the public interest. 2 - Use your consumer power and join the farm salmon boycott These companies will change their behaviour if you refuse to buy farm salmon raised in the ocean. Wild salmon are essential to British Columbia and I don't feel that the risk to wild salmon from the ISA virus has been given adequate consideration. It is not acceptable that only response by the OIE to ISA virus positive results in BC from seven labs has been to damage the credibility and standing of the only independent lab on the forefront of this research. This decision should have been delayed until the research is finished and published, where the broader scientific community could examine the evidence. I have concerns regarding the CFIA's refusal to test Atlantic salmon for this Atlantic virus to declare BC ISA virus - free. I see DFO's failure to return to Cultus Lake and retest the region for ISA virus as irresponsible management. British Columbians are not pleased with performance of Fisheries and Oceans Canada, DFO, and the decline in wild salmon. We do not want Atlantic viruses entering the food chain, threatening the ecology, economy and food security of British Columbia.